Background: Multivariate transfer techniques have become a widely accepted concept over the past few years, since they avoid full recalibration procedures when instruments are changed to analyze a specific sample. Objective: This paper reports a multivariate control chart transfer approach between two near infrared (NIR) spectrometers for simultaneous determination of rifampicin and isoniazid in pharmaceutical formulation using Direct Standardization (DS). 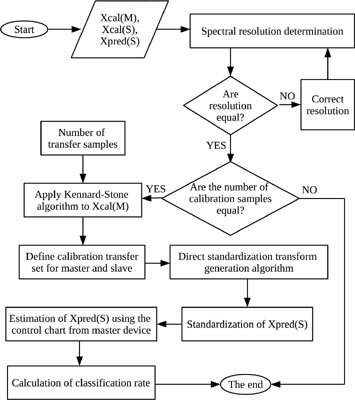 Method: The control charts are based on the calculation of Net Analyte Signal (NAS) models and the transfer samples are selected by the Kennard-Stone (KS) algorithm. Three control charts (NAS, interference and residual) transferred on both the master and slave instruments were measured. Results: As a result, a classification model for rifampicin and isoniazid developed on a primary instrument has been successfully transferred to a secondary instrument. The spectral differences after the standardization procedure were considerably reduced and errors values found in the charts for both analytes were comparable with the errors obtained for the original chart models. Conclusion: The proposed approach appears to be a valid alternative to the commonly used transfer of multivariate calibration models in simultaneous determination of isoniazid and rifampicin in pharmaceutical formulation. Multivariate control chart, NAS, isoniazid, rifampicin, direct standardization, NIR.